I have made and eaten a ton of coleslaw this summer, so when I needed a side dish to go with my ribs recently, I went the potato salad route this time. 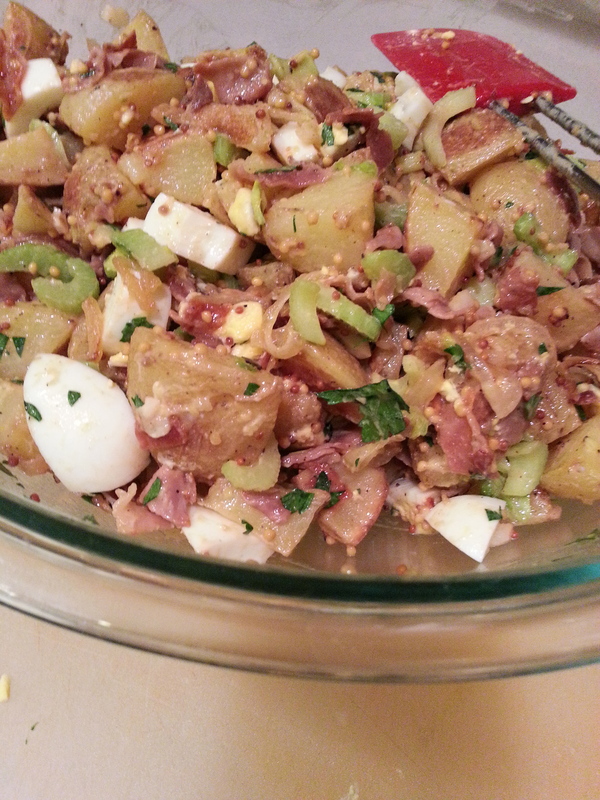 I love traditional potato salad, but was really looking for a spin on it. I decided on this one from Cooking Light July 2006, but because I wanted more than just potatoes and onions, I made some additions. It worked out. You can check out the original recipe and look to see what I did, and decide how you want your dish to be. My whole thought with choosing this recipe was that the mustard and vinegar would cut through the heavy barbecue flavor of the ribs. 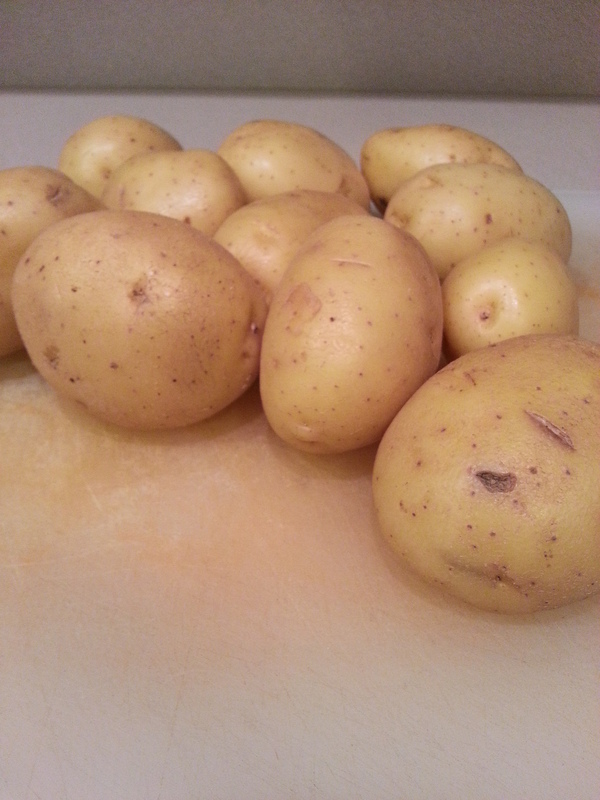 Plus, I didn’t have to boil or peel potatoes! Happiness! I found this recipe easy to make and was exactly what I was looking for. I loved the sherry vinegar and mustard combination which separated this recipe from the usual mayo salad. I changed it up a little (because I’m a pain) and added some expected elements like the boiled eggs and celery. Go with what you might have in your fridge too – snap peas, scallions, bell pepper, cheddar cheese…etc. Once you have the base salad, I don’t think you can mess it up. This is a kickin’ side. Enjoy! Preheat oven to 400. Toss first four ingredients in a bowl and toss to coat. 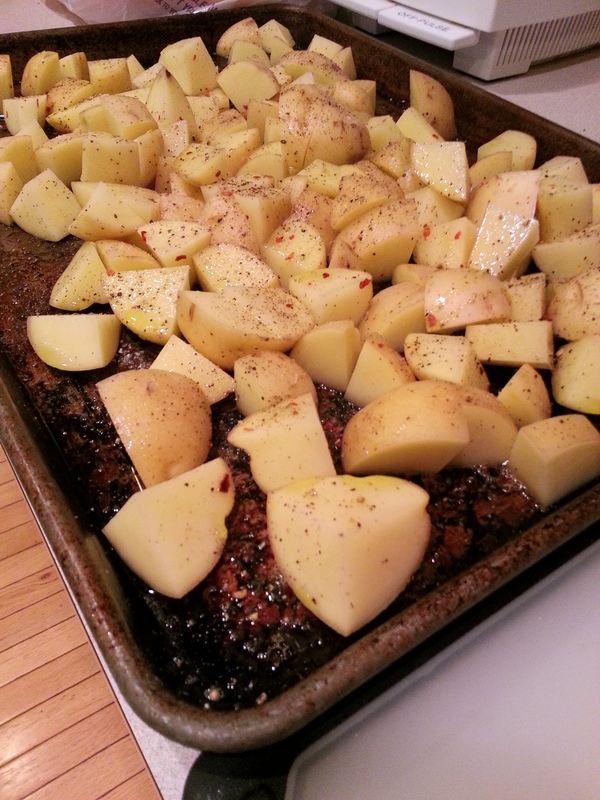 Arrange potatoes in a single layer on a jelly roll pan. 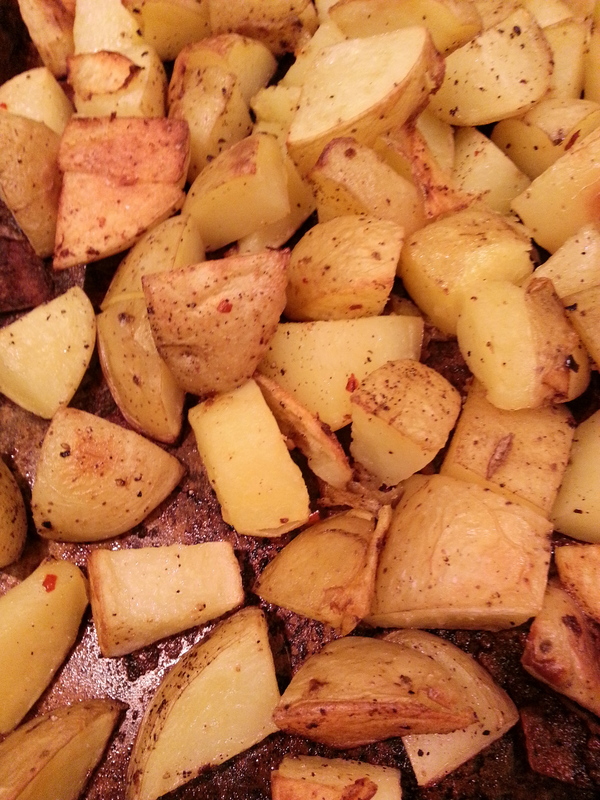 Bake at 400 for 40 minutes or until potatoes are tender, stirring once. 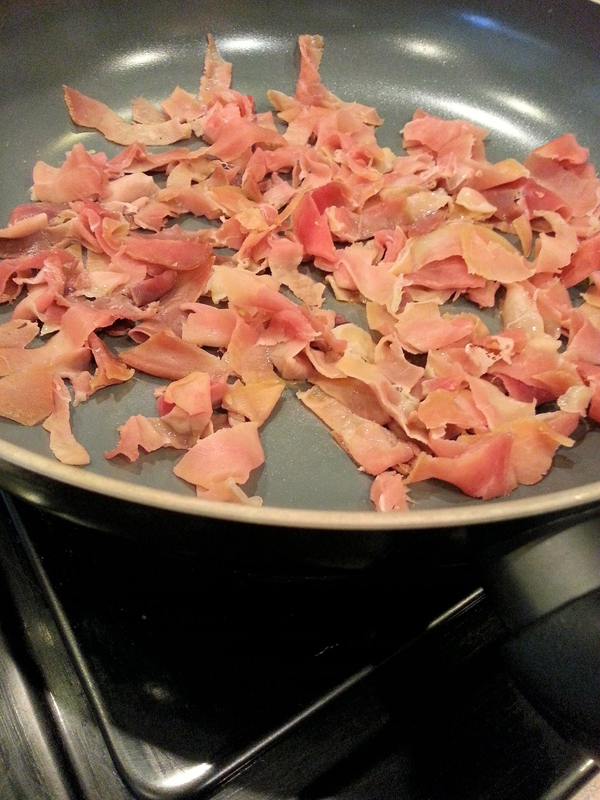 Meanwhile, add sliced prosciutto to a non-stick pan on medium heat and brown until starting to get crisp on edges. Transfer to a large bowl. Coat the same pan with non-stick spray and add onions on medium-low heat. Cook 15 minutes until golden brown and caramelized, stirring often. Add garlic to the pan and cook for another minute. Add onion mixture to bowl with prosciutto. 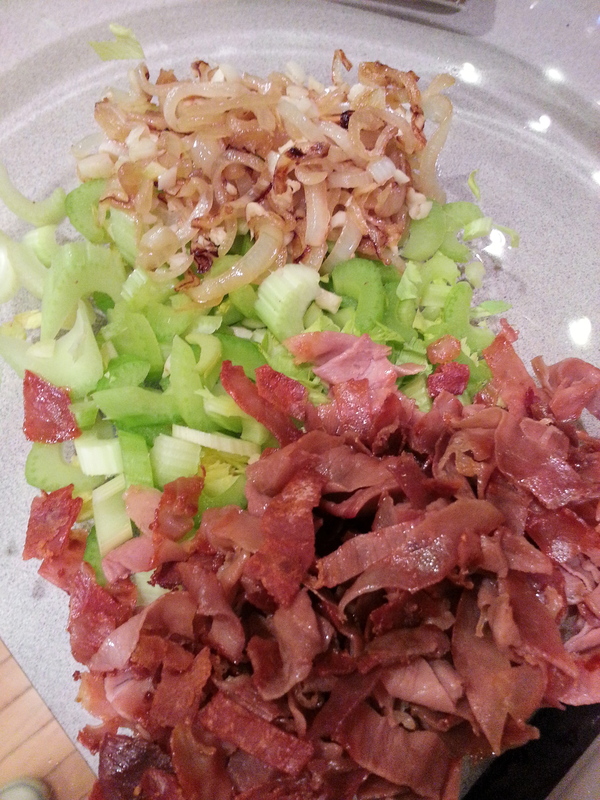 Add celery and potatoes to onions and prosciutto. Stir to combine. Combine mustard, mayonnaise, honey and vinegar in a small bowl and stir with a whisk. Add mustard mixture and parsley to potato mixture and toss to combine. Add eggs last and gently toss. Adjust potato salad with more mayonnaise or mustard depending on your taste. note: This recipe serves 8. Serving size is 1 cup. This entry was posted in sides and tagged mustard, potato, prosciutto, roasted, salad. Bookmark the permalink.